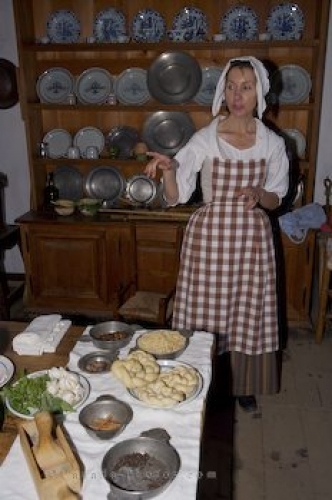 A woman dressed in costume at the Fortress of Louisbourg, Nova Scotia, Canada explains how life was at the De Gannes House, a military Captain's residence. When visiting the incredible tourist attraction at the Fortress of Louisbourg in Cape Breton, Nova Scotia you will find costumed interpreters role playing. This small house has been reconstructed to the times when it was a residence to a military captain, Michael de Gannes and this woman explains the family ways. Costumed interpreter at the De Gannes House (Military Captain) explaining family life at the Fortress of Louisbourg, Louisbourg National Historic Site, Highway 22, Fleur de lis Trail, Marconi Trail, Cape Breton, Nova Scotia, Canada. Picture of a woman interpreter at a military residence at the Fortress of Louisbourg, Nova Scotia.